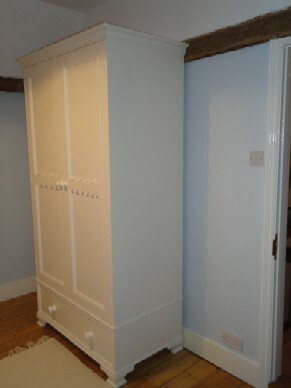 Mr and Mrs M. previous clients from Biddenden wanted a free standing wardrobe in a size that they were unable to find. The armoire was 2030mm high x 1100mm wide and internal depth 560mm.the piece was constructed from Tulipwood and moisture resistant board and spray painted to their choice of colour. The 8″ (203mm) drawer is full width and set on soft close runners. The unit comes in two sections to aid painting and delivery. If there is a piece of furniture that you just cannot find in the right size do get in touch. Because I have deregistered from charging VAT,the added bonus is a custom made piece with NO VAT to pay! Email 2nickholt@gmail.com for a chat.